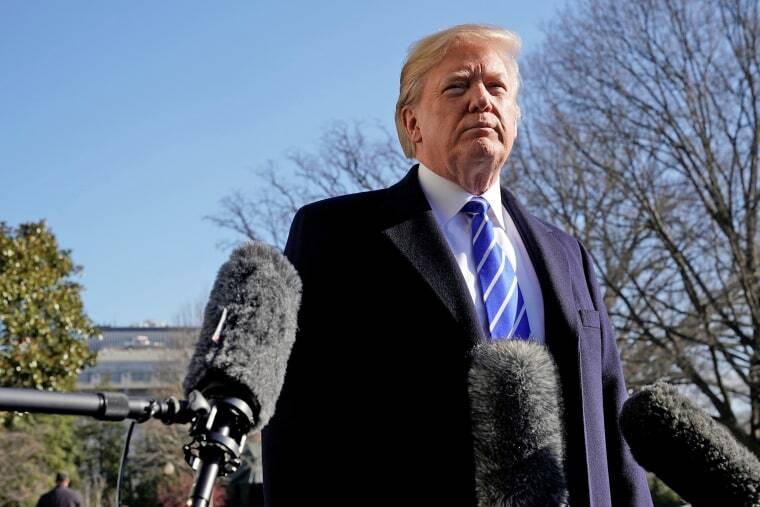 President Donald Trump on Saturday defended the Republican tax plan as Congress appears poised to deliver his administration its first major policy achievement this week. "This is going to be one of the great gifts to the middle income people of this country that they've ever gotten for Christmas," Trump told reporters outside the White House before departing for Camp David. Congressional Republicans on Friday released their final tax bill that would cut the corporate tax rate and overhaul the individual tax code, and which is estimated to increase the deficit by $1.4 trillion over 10 years. Trump said Saturday that "this is going to bring money in" and boost the economy. Democrats are fiercely opposed to the measure. Some analyses of the House and Senate bills found that the largest benefits accrue to the richest Americans, and an expert said Friday that the changes made to the bill don't radically change that takeaway. "The Democrats have their, you know, their sound bite, their standard sound bite. Before they even know what the bill is all about, they talk about for the wealthy," Trump said. The tax bill got a boost Friday when Senators Marco Rubio, R-Fla., and Bob Corker, R-Tenn., said they support the bill after earlier expressing opposition to the measure. Rubio sought an increase to the child tax credit, and the revised bill would make $1,400 of the $2,000 child tax credit refundable instead of $1,100 in the original draft. Votes are planned next week, possibly as early as Tuesday. Senate Minority Leader Chuck Schumer, D-New York, continued on Saturday to criticize the bill as a giveaway to the rich at the expense of the middle class. "Tax hikes for millions of middle class families," Schumer tweeted, and "huge tax breaks for wealthy & corporations." Schumer predicted the bill means "Even better odds the House & Senate become Democratic in 2018." Individual tax cuts expire after 2025. Asked about the expiring tax cuts Saturday, Trump said that it would be up to a future administration to continue them. "What'll happen is, at the end, whichever the administration is, in years from now, they'll make it and maybe can even make it more generous if we can get the economy like it should be," Trump said. The tax bill would increase the deficit by $1.45 trillion over 10 years, just under the $1.5 trillion threshold allowed under the reconciliation procedure that Congress is using to try and pass the bill, according to estimates by the Congressional Budget Office and Joint Committee on Taxation released Friday. The bill also would eliminate the individual mandate that is a key part of the Affordable Care Act, which penalizes Americans who don't maintain health coverage. The CBO estimates that 13 million fewer people will have health insurance after a decade if the mandate is eliminated and premiums will rise by 10 percent on the individual market. Supporters of eliminating the individual mandate say that Americans shouldn't be forced to buy health insurance plans they don't want. The new tax bill cuts the corporate tax rate from 35 percent to 21 percent, among other changes. It keeps the estate tax but the starting point for the tax is doubled. The standard deduction is almost doubled to $12,000 for individuals, meaning fewer people are likely to itemize their taxes. The revised bill also keeps an existing deduction for high medical expenses and keeps a benefit to graduate students allowing them to avoid paying tax on tuition waivers, which had been eliminated in the House version. Republicans believe they have the votes to send the bill to Trump’s desk. Republicans can only afford to lose two of their senators or the bill won't pass.